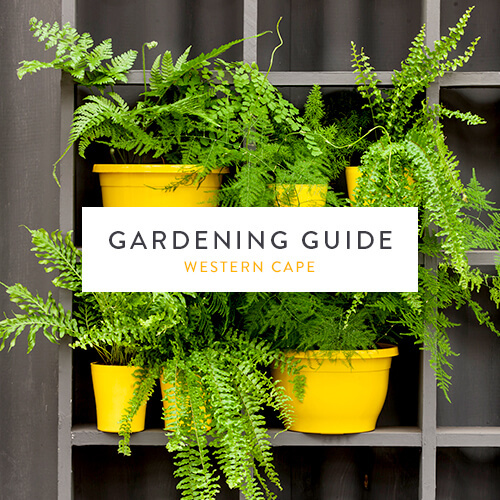 Gardening in November has us all excited for the summer months ahead, and although we still have water restrictions, our garden doesn’t need to reflect it. Follow our gardening guide for water-saving tips to maintain a lush summer garden. Container gardening is becoming increasingly popular and convenient for many gardeners – plus it’s a great way to save water! Use our step-by-step guide to planting in pots, then brush up on ways to save water in containers. Our annual Going Potty promotion will run from 19 October to 18 November at all our local branches to celebrate the water-wise practice of container gardening. Plant summer-flowering bulbs such as dahlias, eucomis, gladiolus and amaryllis. Plant heat-tolerant flowers such as red salvias and vincas for long-lasting summer blooms. Sow seeds of Shirley poppies, Felicias, Namaqualand daisies and forget-me-nots. Grow veggies such as beans, beetroot, cabbage, corn, cucumber, lettuce, melons, parsnip and pumpkin. Add herbs such as oregano, thyme, sweet basil, marjoram and rosemary to your garden. Feed plants with an organic fertiliser such as Guano pills or an all-purpose fertiliser. Use a 3:1:5 fertiliser for flowering plants. Prune fynbos such as buchu, proteas, leucospermums and Ericas after flowering. Give confetti bushes a good pruning. Deadhead rose blooms once their first flush is over. Adding herbs to pots serves a dual purpose – they look and taste great! Have fun arranging different herb pots on your windowsill (it will save water and be easier to access) or create a herb zone in your courtyard or garden. Best of all, most herb plants are easy to look after and use minimal water. Lemon thyme is a popular herb grown for its use in cooking and for its attractive foliage. It has a zesty zing that adds wonderful aroma and taste to chicken dishes. It can also be planted as a fragrant ground cover or amongst pavers along a path or patio. The tiny flowers are bee attractors, encouraging the pollination of surrounding plants.